I have another wonderful book review to bring to you. 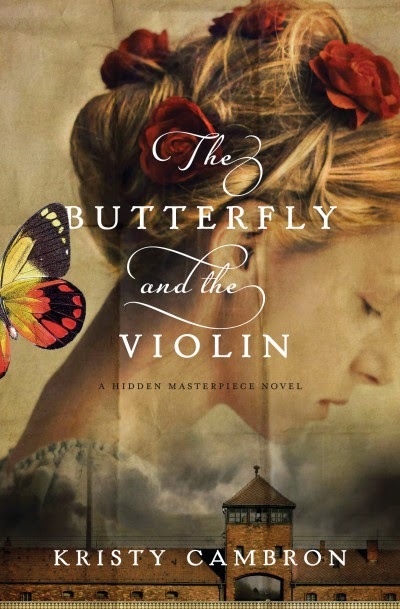 This book The Butterfly and the Violin is written by Kristy Cambron. The book is written from two time point of views - present day and 1942. This was a really good summer read. I was a little nervous about it being too sad with some of the setting being in the concentration camps. It was sad - incredibly so- but Cambron writes a very readable account of the sadness. I did shed tears but it didn't leave me weeping like I thought might happen. This was surprising to me because this subject is rather dear to my heart. We found out a couple of years ago that my paternal grandmother was actually Jewish and from Austria. If she hadn't been in America by the 40's she very well could have been involved. I'm sure some of our relatives are but she passed before I was born so there is no way of asking her. She kept that part of her life very secret from what my relatives have shared with me. The book has a nice twist with the modern characters trying to track down what happened in the past. That mystery helps the story flow nicely. I feel like the past story of Adele was given a bigger spotlight and a better storyline. The modern day Sera's story wasn't as detailed. I could have read more about her life and her thoughts. This book really had a nice mix of mystery, romance, and drama. There was a nice mix of faith thrown in. Overall I really enjoyed it because I had to know what happened to Adele just as much as Sera did! You can purchase your copy of The Butterfly and the Violin at your local book store or at online book retailers like Amazon.